Representatives from Unison, Unite, the GMB and the RCN have all expressed support for Stand up for Labour's event in Bath on 29 November. The establishment of a pay cartel by 20 NHS trusts in the south west has threatened the working conditions of NHS staff, which is likely to have an adverse effect on patient care. A speaker from Unison shall speak at the event to draw attention to this and ways to campaign against the cartel and anyone interested in signing the petition against the move can do so by going to tinyurl.com/cd5ltna. 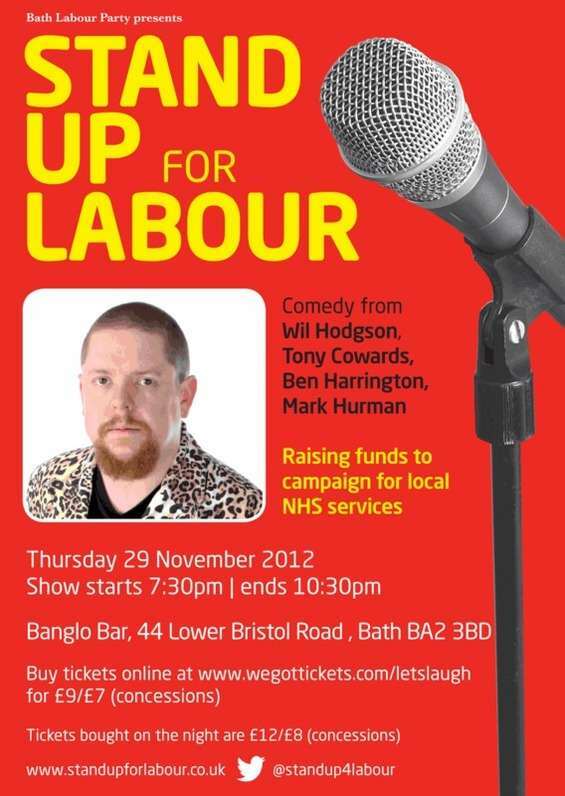 Tickets are onsale at www.wegottickets.com/letslaugh and all profits from the night go to the Bath Labour Party, helping its campaign to support local NHS services. I wish I could go, but sadly I'm working a 13 hour shift at the RUH in Bath that day and the next. Bournemouth have seen the light and dropped out of the cartel. Here's hoping the rest follow? People want a fairer society this means being fair to the carer givers.